The UN Security Council delegation, on mission to Myanmar, prepares to board a helicopter to fly to Maungdaw from Sittwe airport. After seeing for themselves the conditions facing Rohingya refugees in the camps of southern Bangladesh as well as homes they fled in Myanmar, Security Council members called on Tuesday for them to be allowed a safe return. Speaking to the press at the end of a four-day visit to Myanmar and Bangladesh, Council members highlighted the need to establish conditions within Myanmar that allow the “safe, voluntary and dignified return” of refugees as well as accountability for the human rights violations that prompted the exodus. “I think it's impossible not to be deeply moved by what we heard in Cox’s Bazar [southern Bangladesh] and particularly the scale of it,” Karen Pierce, the United Kingdom’s Ambassador to the UN, told reporters at a press conference in Nay Pyi Taw, the capital of Myanmar. Ms. Pierce added that during the Council’s meeting with Daw Aung San Suu Kyi, the State Counsellor urged all concerned to produce evidence that would help the country undertake a proper investigation. Also speaking at the press conference, Mansour Ayyad Al-Otaibi, the Permanent Representative of Kuwait to the UN, called for the full implementation of the agreement between the Governments of Myanmar and Bangladesh concerning the return of refugees. “We saw that the Government of Myanmar took many steps to implement the agreement but I think much more needs to be done,” he said. “What we really want is to speed up the process of the return of refugees in a safe and voluntary and dignified manner,” he added. Gustavo Meza-Cuadra, the Permanent Representative of Peru, reiterated the need to ensure refugees’ security and recalled previous statements made by the Council on the crisis. “Basically the message that we conveyed was that it was very important to improve the security conditions of the return of the refugees,” he said, recalling the visit. Joanna Wronecka, Poland’s ambassador to the UN – which holds the Presidency of the Security Council for the month of May - said that the visit was vital for the Council to gain a good understanding of the situation on the ground. “I would like to pay tribute to my colleagues who prepared this visit, especially the previous Presidency, Peru, and Kuwait, which initiated our preparation as well as the UK for a very substantial contribution to this visit,” she said. Security Council members also urged the international community to continue supporting the work being undertaken by the UN and humanitarian agencies in southern Bangladesh, on behalf of the hundreds of thousands of vulnerable refugees living there. 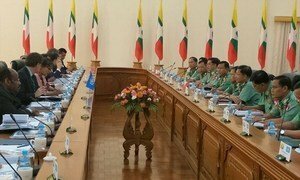 Council members also reaffirmed their “strong commitment to the sovereignty, political independence, territorial integrity, and unity of Myanmar”. Members “intend to discuss in the coming days how the Security Council can work with the governments of Bangladesh and Myanmar” concluded the statement, “as well as the UN, including the Secretary-General’s newly appointed Special Envoy on Myanmar Christine Schraner Burgener, to resolve the crisis and create the conditions allowing the safe, voluntary, and dignified repatriation of refugees to their homes in Rakhine State. The United Nations Security Council is continuing its mission to Bangladesh and Myanmar, taking a first-hand look at the plight of hundreds of thousands of Rohingya refugees who have fled across the border to escape violence.